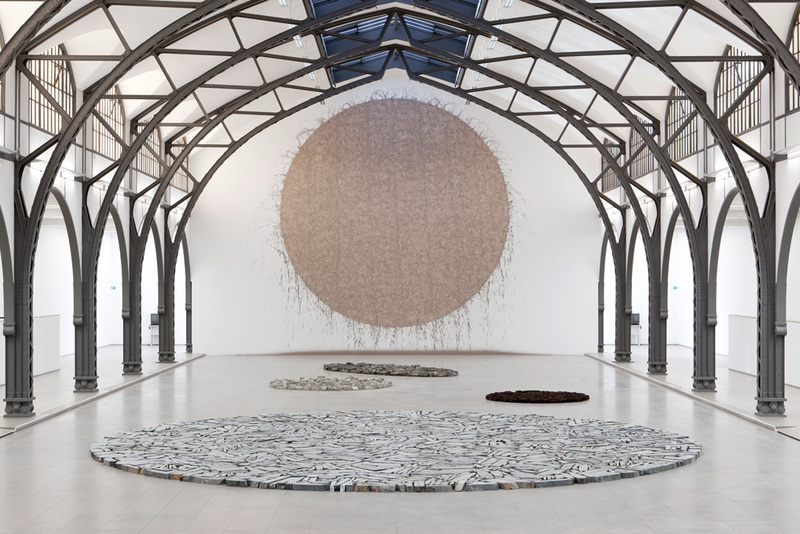 As I was thinking about British artists that I remembered seeing when I was younger Richard Long came to mind. The stone circles that I remember him making resonated with me at the time, and I still find that I’m drawn to simple geometric shapes, his sculptures, lines made by walking, was more of a mystery to me. I find some of his recent ‘mudworks’ to be quite interesting. Long considers these to be two dimensional sculptures having originally started this work on the ground before progressing to working on walls at quite a massive scale. The mud that is used in the work comes from the river Avon, a choice that reflects his upbringing on the banks of this river. As can be seen in the image above he’s brought some of his stone work indoors, making both mudworks and stone circles that interact with each other for some of his exhibitions. I’m enjoying reading Juliet Miller‘s analysis of Long’s work in her book ‘On the Track of Richard Long‘. It’s worth a read if you can find the book.